Hello? Is this thing on? Anyone out there? ;) Yeah, I know - it's been awhile. But to say that things have been a little crazy around here is an understatement. For those of you that don't know, I live in New Jersey. Right before Halloween, Hurricane Sandy swept through our area and left lots of devastation behind. We were without power for days, running out of food and gas, unable to reach family members, freezing in our house, etc. And we were the lucky ones. We got power back 5 days after the hurricane only to lose it a few days later thanks to Winter Storm Athena. And again ... we were the lucky ones. We regained power several days after that, only to lose it a third time when temporary repairs at one of the substations that power our area caught on fire. And still ... we are among the lucky ones. We have a lot to be grateful for this Thanksgiving. The destruction caused by these storms throughout the tri-state area is unreal. So many lost their homes, everything they owned, and even loved ones. It has been a truly humbling experience. It goes without saying that no power = no scrapbooking so it's been awhile since I've played with paper and glue. And to be honest I haven't really wanted to, but I'm starting to get that itch again and that's a good thing. 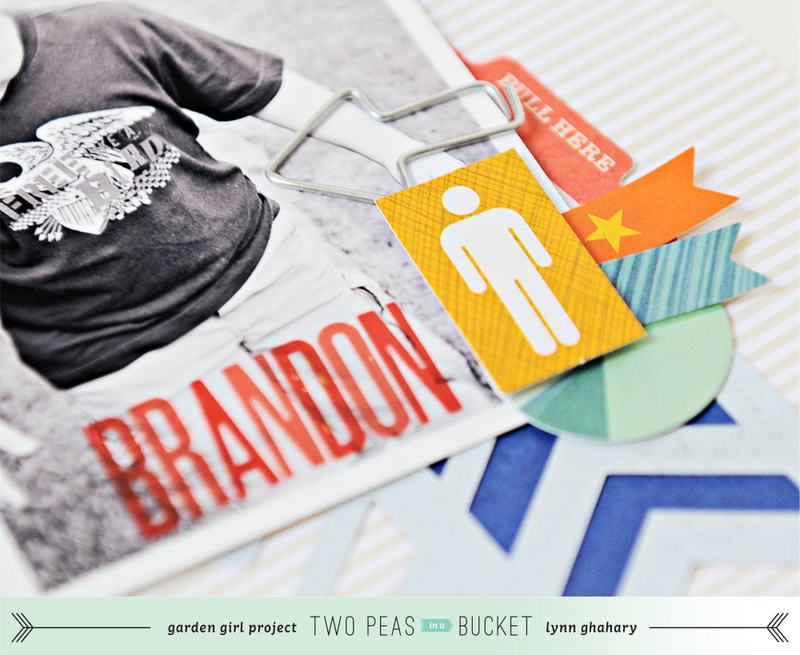 Before all of this happened (feels like ages ago) I had created this layout for Two Peas In A Bucket about my youngest son Brandon. 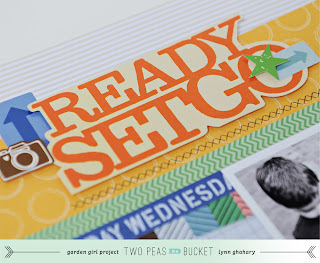 I used lots of goodies from the amazing Ready Set Go collection by Amy Tan for American Crafts. 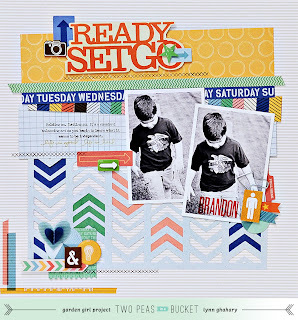 This is a great collection for everyday scrapbooking and perfect if you have boys to scrap in your life. I used my Silhouette to cut the chevron background and then backed parts of the design with patterned papers for a really fun effect. The embellishments in this collection are SO.MUCH.FUN. and I added them here and there in clusters along with a bit of stamping using stamps from Ali Edwards for Technique Tuesday. This layout is about the daily balancing act I have with my youngest as he learns to be more independent. I think I'm struggling even more with this with him because he is my youngest. In so many ways he wants to let go and push forward, while at the same time holding on tight. I find myself doing the same and so it feels like at times we are in a tug of war - pushing and pulling from either side. We'll figure it out - I know we will. The "Ready Set Go" sticker seemed like an appropriate title for this layout and I set it off with a bit of stamping and added die cuts and stickers for extra detail. I added my son's name to the bottom of one of my photos with the letter stickers from this collection. They are somewhat transparent so it adds a really fun effect when you place them directly on photos. I added a few more embellishments and an arrow clip as well (LOVE these clips as well as the other shapes available in the Two Peas store) to finish things off. 11cSo glad you are safe, Lynn and that you are now on the other side of a really horrendous situation. We are some of the lucky ones, too. Indeed there is a lot to be thankful for this year. Big hugs! 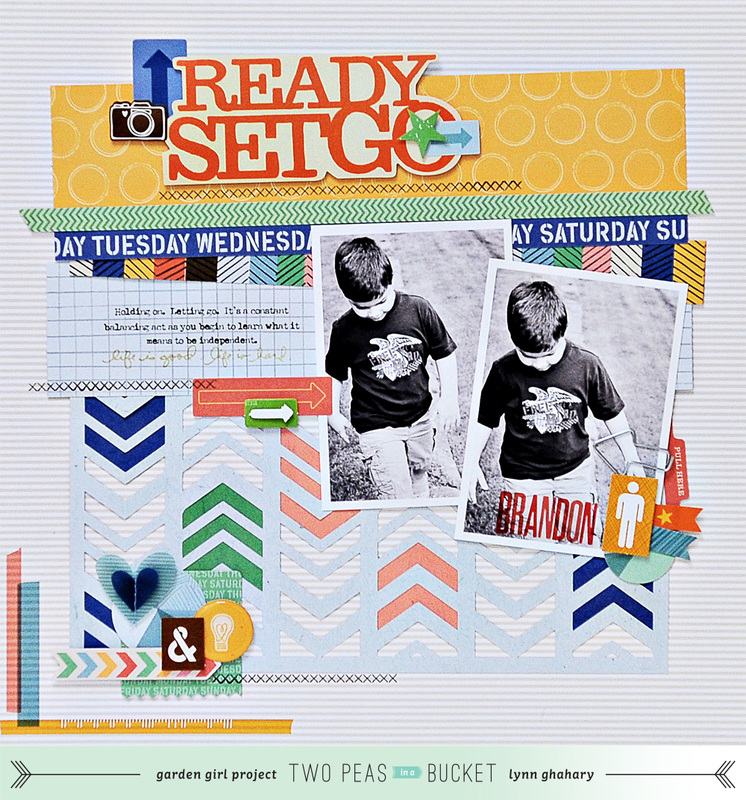 I love this page of Brandon. Such great colors and elements. I too know of that tug a war that you speak of. It is really hard letting go. So glad that you're family was ok. 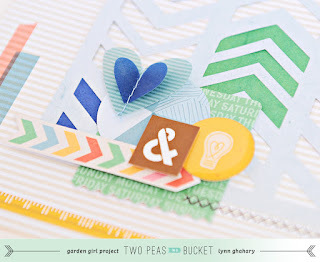 I am glad that you're feeling like scrapping again because your work is so inspiring. This layout is gorgeous! Lynn, so glad that overall your family is ok. What an emotional and scary time. brings such perspective to what we all tend to get so comfortable with and take for granted. I'm sure it has been tough for your kids too. Praying for yo and your family.